Digium announces new phones. See my full post here. A few additional thoughts on Polycom, Aastra, and Snom – all three of which have been at every Astricon I’ve attended. Polycom had a great ride in phones. It started with its analog speaker saucer. No PBX maker could justify the R&D to create a high-end speaker saucer for its own (digital) customers since saucers weren’t a high quantity item. Polycom didn’t look at just the audience of an Avaya, Cisco, Mitel, NEC, or ShoreTel, but rather the whole market. It justified the expenses associated with quality R&D and manufacturing and effectively defined a new category – the uber speaker saucer. Every major vendor embraced it as it made their own solution stronger without being a competitive threat. How do you top that? Gradually, SIP began to displace analog, and Polycom again heralded a new generation of general purpose endpoints. The first SIP phone I ever saw was a Polycom IP-501, the gold standard of its time. Polycom was among the first – working closely with Digium, Sylantro, Broadsoft, and others. It was déjà vu all over again. Polycom developed the best SIP phones the industry ever saw – quite literally. The SIP endpoint market exploded, and over the past five years a lot of new makers of SIP phones entered the scene. Aastra and Snom crowded in on the Asterisk and hosted markets, and Avaya, Cisco, Mitel, and NEC introduced their own SIP endpoints. More recently, Grandstream, Panasonic, RCA, Yealink, and several others have entered the space. But throughout all this, Digium and Polycom stood united – until today. The SIP phone business can’t be the high margin business it once was. Price pressure will continue to mount and Polycom’s advantages over production costs will likely erode. 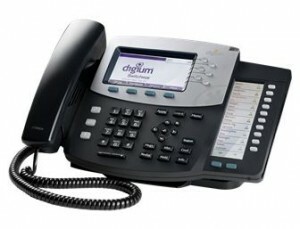 Polycom has only introduced one new wired phone in the past several years. It acquired Kirk in DECT for wireless which seems practically defunct, and it recently closed its Boulder office once known as Spectralink. Aastra worked hard to differentiate its phone with a rich SDK and powerful APIs, exactly what Digium is now doing with its new phones. Aastra and Digium haven’t had the best relationship over the years, but many Digium dealers like the Aastra phones. Aastra has been an active participant in Digium’s partner program. Of course, one big difference with Aastra is its always been a full fledged competitor on the call manager side. Last year, Aastra agreed to Microsoft’s licensing program to manufacture Lync phones. However, that is a totally separate line of phones. Since then, Snom cracked the code and reverse engineered their SIP phones to work with Lync. Microsoft responded (for a fee) by “qualifying” the Snom solution. Since manufacturing is all about high quantities, and distribution/logistics is all about reducing model quantities – Aastra must be looking pretty hard at following the Snom model. This move by Digium just may be the proverbial straw. Rumor has it that Digium tried to acquire Snom a few years back. Instead, Snom expanded into telephony with its Snom One platform and now Digium has now expanded into phones. Snom brilliantly positioned its IP phones as the only SIP phones compatible with Microsoft Lync. Switchvox recently embraced Snom phones with its provisioning tokens, but with limited (compared to Polycom) functionality. Unlike Polycom, which gets distracted with video, Snom keeps focused on its IP phone line and has introduced several new models over the past few years including new wireless and paging solutions. Snom could be well positioned to be the SIP third party of choice with specialized SIP devices as long as the larger vendors don’t consider Snom ONE a competitive threat. It is actually a bit surprising that Digium is getting into branded phones directly that are proprietary even. I imagine the internal debates were pretty interesting on this one. They clearly wanted a bigger portion of the revenue, and had to fix the channel margin situation (the dot coms make selling phones with margin a liability). But the open source company going proprietary – to each desktop – is a significant shift. Also, the challenges associated with contract manufacturing and distribution are non trivial. The company currently sells physical boards and servers – low quantity items. These phones are very inexpensive – but are they cheap? (I have not seen one yet). Remember, Digium are building in 30% margins for the channel, and they are still less expensive than competitive options. Can they really compete against the current options in terms of quality? On the surface, I like the notion of licensed code to major manufacturers better. I like the code being open sourced and unlicensed even better. I won’t pretend to have mastered all the pros and cons of these arguments and I’m sure Digium worked the various models thoroughly. It will be interesting to see if the open source community truly embraces proprietary phones – somewhat contrary to the creed. Though I don’t expect much resistance from the Switchvox camp. The most puzzling part of the whole thing is the phones are boring. Why not use this as an opportunity to change the game? I would have loved something like USB headsets or wireless handsets – touch screen dial pad, blue tooth, etc. These are a blast from the past. It sure looks like Digium is looking to compete on price instead of innovation.